Health Education England’s (HEE) Chairman Sir Keith Pearson and Director of Nursing, Lisa Bayliss-Pratt, joined a celebration event at Queen’s Hospital to recognise our healthcare assistants (HCAs) who have completed their Care Certificate. Read " VIPs join the celebration as our healthc…"
A reformed scrooge paid a visited to Queen’s Hospital to deliver presents to poorly children in our Emergency Department. Read " Larger than life elf visits poorly child…"
Primary schoolchildren got to sing some of their favourite carols at Queen’s Hospital just before Christmas – including Rockin’ Robin. 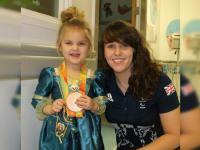 Read " Beam County Primary School singers get v…"
Paralympic swimmer Amy Marren, who won Bronze in the Rio Paralympics this year, paid a visit to Queen’s Hospital just before Christmas to hand out presents to our poorly young patients. Read " Local paralympian brings along her Rio b…"
It was in December 2006 that Queen’s Hospital first opened its doors to our patients, replacing the former Oldchurch and Harold Wood hospitals. Read " We marked 10th anniversary of Queen’s Ho…"
Poorly children at Queen’s and King George hospitals have had their day brightened by visits from football stars. 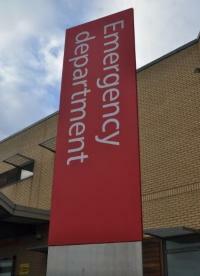 Read " Football stars delight sick youngsters b…"
Due to significant pressures on healthcare services across London today, our Emergency Department at Queen’s Hospital is busier than usual. Read " High demand on our Emergency Department…"
Read " Our Chair has made an impact…"
A new asthma toolkit has been launched to support clinicians, GPs, pharmacists, commissioners, schools and parents in care in London to provide the best care for children and young people asthma. Read " New toolkit to improve children’s asthma…"
The festive season is well and truly underway at Queen’s Hospital, after children from Suttons Primary School were the first choir to perform in our atrium yesterday (Monday 5 December). Read " Children’s choir brings festive cheer to…"